Technology transfer personnel often talk about how hard it is to get to the finish line with a promising IP asset. This means getting the IP properly developed, licensed and commercialized so that the university and contributing inventors are then on the receiving end of a windfall that can potentially fund research and improvements at the institution for years to come. It’s a rare and wonderful occurrence, to be sure. Cause for celebration. However, what if all those very difficult steps occur, but somehow the rightful inventor and the university are cut completely out of the deal? This is also a very unlikely occurrence, one would think, but it is precisely what the University of Missouri in Kansas City (UMKC) is alleging has taken place there. In a lawsuit filed in March, the university accuses pharmacy professor Ashim Mitra of stealing a student’s discovery and then selling it to a pharmaceutical company behind the university’s back, defrauding the institution of millions of dollars. The IP in this case involves a more effective way to deliver drugs to the eye. The suit names Kishore Cholkar, a former student of Mitra’s, as the rightful inventor, and Cholkar concurs, indicating to reporters that he was the only student who worked on the invention and that he was cheated out of any credit for the discovery as well as any resulting proceeds. The suit states that Mitra has already pocketed more than $1.5 million from the sale of the discovery, and that he has the potential to earn as much as $10 million in royalties over the next decade. Court documents indicate Mitra sold the discovery to Virgin Islands-based Auven Therapeutics Management, which then resold the invention to Sun Pharma, based in India, for $40 million dollars and forthcoming royalties. Sun Pharma has since won FDA approval to market a drug for dry eye which is based on the discovery. Mitra denies the accusations, saying he is the inventor of the technology. Indeed, a 2015 patent for the technology in question names Mitra and an Auven employee as the inventors, according to the lawsuit. However, in the midst of the whole mess, Mitra has officially resigned from UMKC. Meanwhile, the litigation ensues. Named in the university’s suit are Mitra and his wife Ranjana, who worked as a research associate at UMKC, as well as the couple’s company, Mitra Consulting Services Inc. The suit also names the two pharmaceutical companies involved. How did such a potentially valuable invention get so far down the road without the university or other stakeholders blowing the whistle sooner? That’s unclear at this point, but the fact that that it did makes one wonder what TTOs could be doing to ensure that they never experience such a case. While there is no foolproof hedge against dishonesty, experts tell TTT that there are things universities and TTOs can do to guard against later-stage disputes over inventorship, royalties or other matters — the kind of disputes that can sabotage commercialization and lead to costly litigation. 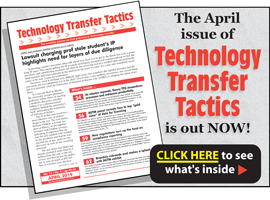 A detailed article advising TTOs on precautions and procedures to prevent inventorship-related dispute appears in the April issue of Technology Transfer Tactics. For subscription information, CLICK HERE. University-based start-ups and other licensees often enjoy a close relationship with the faculty inventor of the technology the company or license was based upon. Whether or not a formal consulting agreement is in place, these companies tend to rely on the researcher to provide information as needed to help further the technology. This know-how, along with data and other information, can be crucial to the growth of the company and should be valued as such. While IP licenses address the patent, ownership, and practicing rights of an invention, the PI’s “know-how” is usually ignored simply because assigning an actual dollar amount to information inside one’s head is tough to calculate — and can be even harder to negotiate. But, ignoring it can cost you big money in the long run as a growing number of universities — who routinely incorporate know-how into their licenses — can attest. By aggressively negotiating these know-how rights, TTOs are capturing literally millions of dollars that would otherwise be lost. At the same time, they’re cementing valuable relationships with companies and supporting the progress of their innovations to the marketplace. That’s why Technology Transfer Tactics’ Distance Learning Division is teaming up with two attorneys who will teach you how to value know-how, how to draft a royalty schedule for know-how, and how your negotiation can maintain the financial integrity of know-how while enjoying a positive, collaborative relationship with the licensee. Please join us on May 23, 2019 for this practical webinar: Licensing Know-How: Capture the Full Value of Your Technologies and Foster Supportive Relationships with Licensees. For complete program and faculty details and to register, CLICK HERE. The uniquely practical TechAdvance Technology Assessment Handbook and its companion online version (available in English, Spanish and German) offer an objective and scientifically proven model for assessing your portfolio of technologies and identifying those with the greatest potential for successful commercialization. Tech Transfer Central is offering this outstanding product through a partnership with apprimo, a Münster University spinoff company whose tech transfer staff developed the system. The affordable TechAdvance tool has been carefully tested over years of development and is designed to provide a consistent, organized, and objective system for investing your limited resources in technologies with greatest chance for commercial success. For complete details, CLICK HERE. The University of Pittsburgh’s Swanson School of Engineering has chosen Scott Morley, an experienced life sciences executive, to serve as director of the Coulter@Pitt medtech accelerator program. Coulter@Pitt helps faculty researchers turn their medical technologies into products with real-world applications. “Scott brings extensive experience in developing and commercializing medical devices from bench to the bedside, and our translational research teams across campus will be well served by his expertise,” says Sanjeev Shroff, the Gerald E. McGinnis Chair of Bioengineering at Pitt. Morley has served as lead engineer at Pitt startup ALung Technologies, where he oversaw development, led clinical studies and directed a global product launch for the start-up’s artificial lung technology. He currently serves as entrepreneur-in-residence at the University of Pittsburgh Innovation Institute, supporting the commercialization of life science innovations with a focus on medical devices and diagnostics.